Drastically lower rates for businesses. Fewer income tax rates for individuals. A much larger standard deduction and child tax credit. A repeal of the estate tax. 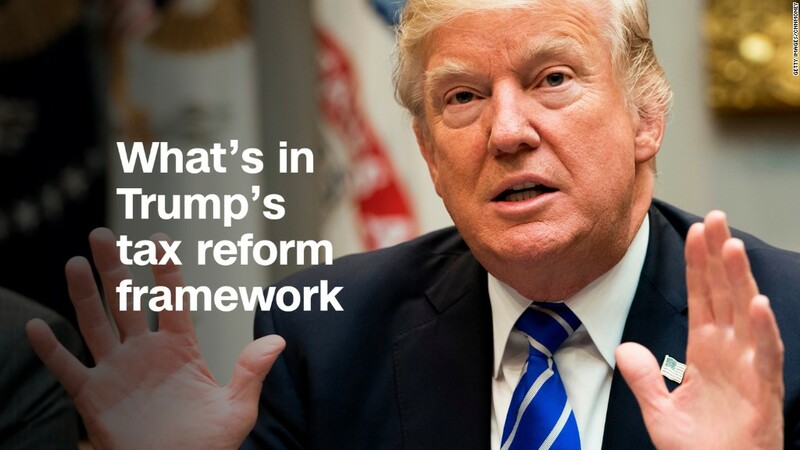 CNN obtained a copy Wednesday of a Republican framework for tax reform that has been in the works for months and will finally be presented Wednesday. The blueprint, which President Trump will discuss in a speech Wednesday, omits many critical details and numbers that congressional tax writers will now have to decide on as they draft legislation. It's not clear yet, however, just how closely the tax-writing committees will hew to that framework since it's been negotiated behind closed doors by just six key players from the White House, House and Senate. And even that small group -- known as the Big Six -- took a long time to reach broad agreement. Reduce individual income tax rates: The framework shrinks the number of tax rates to just three from seven today. The proposed rates are 12%, 25% and 35%. But it will be up to the tax committees to assign income ranges to each rate. Also, the drop in the top rate to 35% from 39.6% may not stick. The framework gives tax legislators the "flexibility" to add a fourth rate above 35% to ensure reform keeps the tax code at least as progressive as the current system. If 35% remains the top rate, Democrats will charge that reform is just giving a big tax cut to the wealthy. And even though the administration says it wants reform to offer middle class tax relief, the framework calls for a 12% bottom rate, which is actually higher than today's lowest rate of 10%. But typical families in the 10% bracket today "are expected to be better off" when all the changes under reform are considered together, the blueprint says. Increase standard deduction: The plan doubles the standard deduction, to $24,000 for married couples and $12,000 for single filers. Doing so would drastically reduce the number of people who opt to itemize their deductions, since the only reason to itemize is if your individual deductions combined exceed the standard. Increase child tax credit: The framework calls for a "substantially higher" child tax credit, which today is worth $1,000 per child under 17. It will be up to lawmakers to determine how much higher to make it. In addition, it would raise the income thresholds for eligibility for the credit, meaning more people would qualify for it. Get rid of valuable tax breaks: The framework proposes the elimination of most itemized deductions, including the state and local tax deduction. It also eliminates personal exemptions, worth $4,050 per person. So a family of four could no longer reduce their taxable income by more than $16,000. Preserve some deductions: Again without specifics, the framework calls for lawmakers to retain tax incentives for home ownership, retirement savings, charitable giving and higher education. But that doesn't mean lawmakers won't seek to modify the tax breaks that currently exist in these areas. Repeal the Alternative Minimum Tax: The AMT most typically hits filers making between $200,000 and $1 million. It was originally intended to ensure the wealthy pay at least some tax. Kill the estate tax: What Republicans refer to as the "death tax" only affects about 0.2% of all estates -- and only those worth more than $5.5 million. Cut corporate tax rate to 20%: Such a drastic drop from today's 35% rate would put the U.S. rate below the 22.5% average in the industrialized world. But doing so will be expensive. It's estimated to cost roughly $1.5 trillion over a decade. Drop tax rates on small businesses and other pass-throughs: The top rate would be 25% down from 39.6% on the profits of so-called pass-through businesses. A pass-through passes its profits through to partners and shareholders, who then report them on their individual returns. The framework will recommend the committees include measures to prevent gaming, in which people try to recharacterize their wages as pass-through profits to get the lower rate. Change how U.S. multinationals are taxed: Today, U.S. multinational firms pay a 35% tax on overseas profits when they bring them back to U.S. shores. The framework calls for a switch to a "territorial system," where the overseas profits of U.S. companies would no longer be subject to U.S. tax, just to the tax of the government where the money was made. The hope is that the new system will make U.S. companies more competitive with their foreign counterparts, and that they will use more of their foreign profits to invest and create jobs in the United States. But to dissuade U.S. companies from artificially shifting their profits to low-tax (or no tax) havens, the framework also would impose a minimum foreign tax, though the rate is unspecifiied. In addition, it would offer a low, one-time tax rate on existing overseas profits to entice companies to bring that money back too. It's not yet clear if the tax would have to be paid even if the money isn't brought back.